Emily Koziczkowski is a shining example of how life’s challenges shape who we become. Emily’s yearbook quote: “Life’s a climb but the view is great” exemplifies her approach to her education. She took the most rigorous classes offered at Kenai Central and still excelled. When she had completed the highest math offered, AP calculus, she decided to continue taking math at Kenai Peninsula College. She took calculus II and III and earned A’s in both classes. Additionally, she took psychology so that she could get a head start on some of the general college requirements. She has maintained a 4.0 GPA throughout high school, she is an Honor Graduate, and represents Kenai Central as one of the valedictorians. Because of her dedication to excellence in her education, she has received a variety of scholarships to help pay for her college. In the fall she will attend Portland University and pursue a degree in chemistry. Since middle school, her dream has been to become a doctor. She will achieve this goal one day! Emily is not just an academic, she is a well-rounded young woman and is a role model in how she gives back to her community. 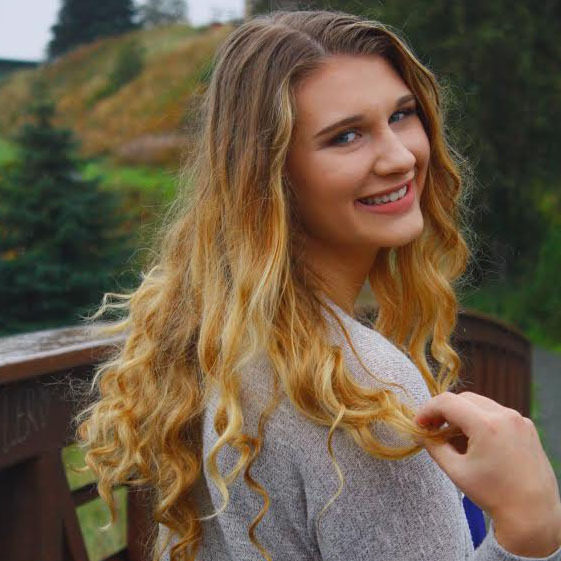 She has a drive to help others and demonstrates this by volunteering at the Leeshore Center and the Central Peninsula Hospital, and by coaching volleyball at Kenai Middle School. She is a leader. She was captain of the softball team for the 2016 season, was President of NHS in 2017, and is valuable asset to the KCHS varsity volleyball team. Emily will leave Kenai Central with everyone cheering her on! This entry was posted on July 12, 2017 at 4:50 pm. You can follow any responses to this entry through the RSS 2.0 feed. You can skip to the end and leave a response. Pinging is currently not allowed.